Holiday Tree in Gazebo to Honor Those Who Serve. To show our support for the men and women who sacrifice everything for our safety and well-being. The tree has been generously donated by Kurtz Christmas Tree Farm located at 22350 Quarry Road in Wellington. The Kurtz Christmas Tree Farm is celebrating their 51st year planting and selling Christmas trees. They will be open 10-7 daily starting the day after Thanksgiving. They sell a variety of Christmas trees, wreaths, and white pine roping for indoor and outdoor decorating. It is one of the few places in the area where you can choose and cut your own tree up to 12 feet tall. 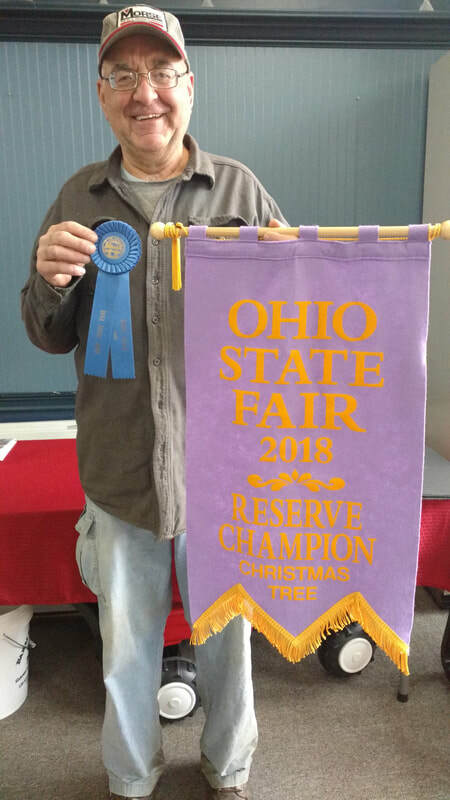 Mr. Kurtz (pictured to the right) recently entered a White Pine Tree in the Ohio State Fair and won a blue ribbon and the 2018 Reserve Champion Honors. Main Street Wellington, Inc. decorates a live evergreen tree to honor the men and women who serve in the military, police, fire, or as EMT. The ornaments display names of Wellington area individuals who are currently serving, Veterans, or heroes who have passed. The tree will be displayed in the Wellington Gazebo in front of the historic Town Hall throughout the holiday season. To add a name to the tree, please fill out the box below or call Main Street Wellington at 440-647-3987. Main Street Wellington staff and volunteers will cross reference our list to the ornaments to make sure we have every ornament accounted for as some ornaments are taken or blown away by the wind. Click Here for a link to the current list as of 12/21/2018. Please check the list prior to sending in names. Thank you! If you'd like to assist in decorating the tree- you can also call Main Street Wellington or fill out the box below. We will generally get the tree [typically donated by Kurtz Christmas Tree Farm] shortly after Thanksgiving and decorate it prior to the first Saturday in December. Add a name to the "Tree for Those that Serve."